Ark International Sourcing is quality buying services providers, exporters of home textile and towel range from Pakistan. Ark International has a rich experience in the art of creating quality woven fabric home textile products wide range of towels using only the finest materials and accessories from around the world. The home textile and array of towel products offered by us comes in multitudes of colors, sizes and quality counts. Our ultimate aim and focus is stringent quality controls at all levels to provide high quality and with great service, exceptional value and ensuring international standards. With the growing need of time & market demand, we are growing to expand our customer base of Home textile and Towel throughout the globe and cover the needs of foreign buyers. 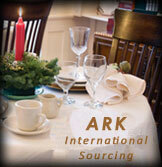 ARK International supplies Home-Textile i.e., Bed sheet sets, Cotton, Polyester & Polyester-Cotton (PC), Flannel Dusters, Napkins, bed linen, pillow covers, Terry Fabric, kitchen linen, curtains and sofa covers. Our Home textile products and Towel selection come in diversified types and designs. e.g., face towels, hand towels, bath towels, bath sheets, tea towels, beach towels, hotel towels & bathrobes. Simply reach us with your queries relating to home textile and terry towel via email and we provide you with a solution based on competitive prices, high quality and on-time delivery.